It’s an exciting time of the year in the late summer with preserves-a-plenty to be planned over the coming weeks. With an abundance of vegetable and fruit on the allotment preserving is a key part of the growing year. Now I adore pickled shallots and can eat them straight from the jar! 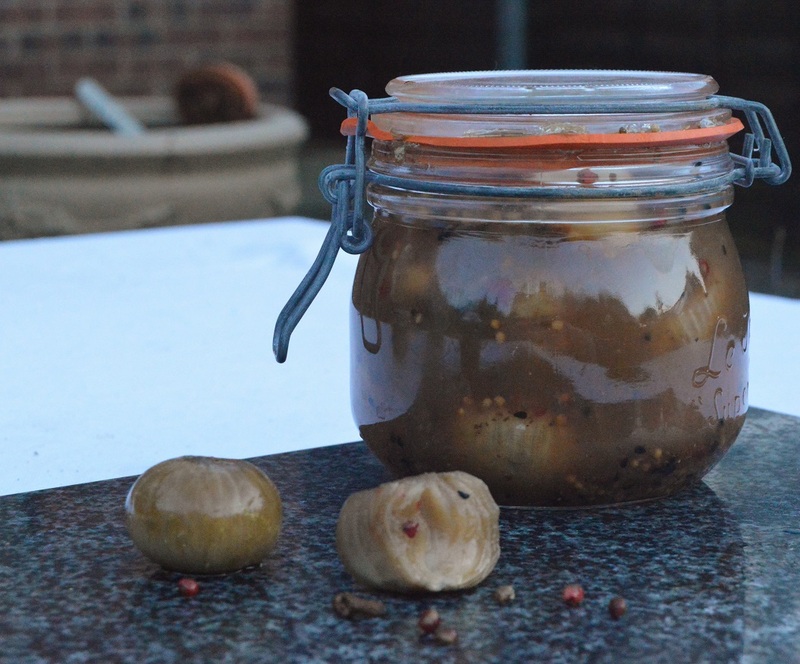 Along with other preserves (such as piccalilli), I cannot go into the autumn without having made a batch or two of pickled shallots. Commerically, most pickled shallots are fairly expensive and are rarely that good. 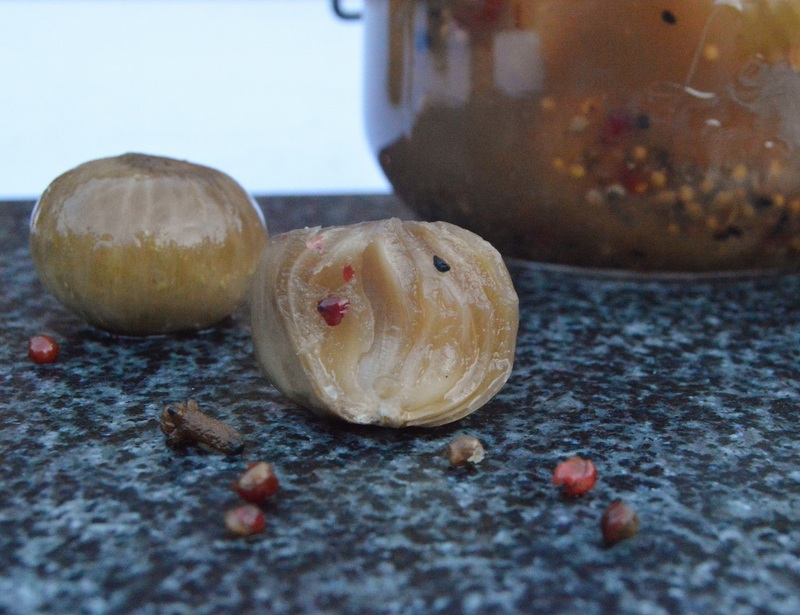 The pickling vinegar can be too astringent, with no real flavour, with the poor shallots drowned in their brown sea, quite oblivious to their fate! These peeled shallots will be mixed with sea salt (dry-brined) and left overnight before bottling in a spiced and lightly sweetened vinegar. This recipe doesn’t have exact measurements; I tend to “wing” it with the proportions depending on how many shallots I have. The main aim is to get a nicely flavoured vinegar, but as long as there is enough vinegar to ensure the shallots are covered when they are in their jars then all will be fine. It is better to make too much of the vinegar stock rather than too little – if you don’t use it up in one go, it can be added to and used for another batch. There are many recipes that suggest boiling the shallots in vinegar for a bit, but I prefer my shallots to be very crunchy, so the dry brining does the trick better for my tastes. The vinegar mixture (basically cider vinegar with a mixture of spices I like) that will get added to the shallots will, over the next couple of months, mellow the shallots and add a lovely flavour to them without detracting from the actual shallot flavour. Once a jar of shallots has been eaten you can re-use the flavoured vinegar: it is great in chutneys and other preserves. I have also made this at other times of the year using thickly sliced onions, sometimes keeping them in rings, at other times not: these can also be eaten all too easily! (1) For the dry brining, mix the salt with the peeled shallots and cover with clingfilm. Leave overnight. Rinse well and pat dry on clean tea towels. (2) Pour the vinegar, sugar and the spices into a large pan and bring to the boil, stirring to dissolve the sugar. Take off the heat and leave to cool. Taste the flavoured vinegar and adjust accordingly, adding more sugar if you want it sweeter or more spices/chilli – a hint of sweetness with a definite sharpness yet not too harsh to the taste is what you want. The spice flavours will develop over time so don’t over-do them. (3) Divide the shallots into sterilised jars and pour over the cooled vinegar, making sure you distribute the spices between the jars. Seal and leave to mature for 2 months or so before eating. Refrigerate once opened. 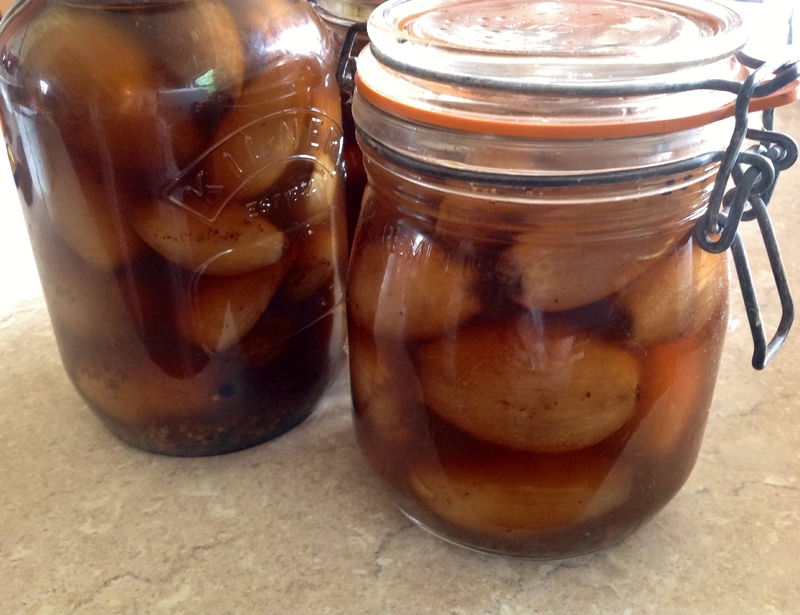 pickled shallots: now leave to mature!